By the end of March, your mind is only on one thing: hiking. When you recently stowed away your skies and heavy winter gear, you pulled your hiking boots out of storage at the same time. Since then, they’ve been staring at you each time you open your closet. You’re ready to start stuffing roll-up pants, Darn Tough socks, and a water bottle in your daypack. But hold on. The trail you really want to tackle doesn’t open until June. You may not be able to pronounce the Buiräbähnli Safari, but you’ve been itching to tackle the new trail since it opened. The trail is in the Uri Alps in Central Switzerland. It begins and ends in the small of village Engelberg, which is surrounded by rivers, glaciers, and, of course, mountains. Lauchernstock, Ruchstock, Gross Gemsispil, and Titlis are just a few of the peaks you can see from the center of town. 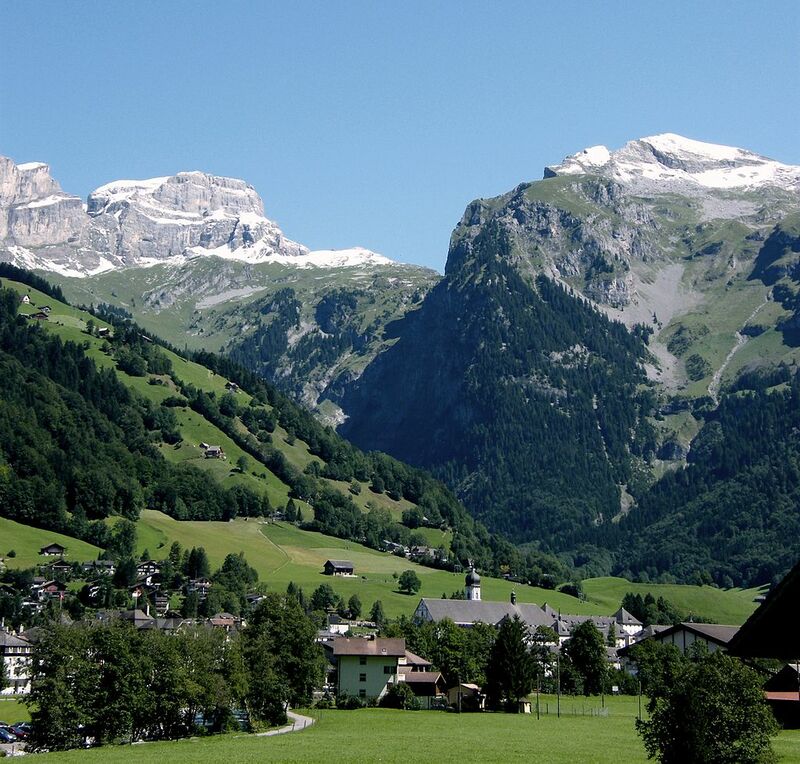 Engelberg was established in the Middle Ages, when Benedictine monks built an education-focused abbey in the valley. The abbey continues to draw visitors to Engelberg today. Outdoor sports—from skiing and sledding to climbing and biking—do, too. 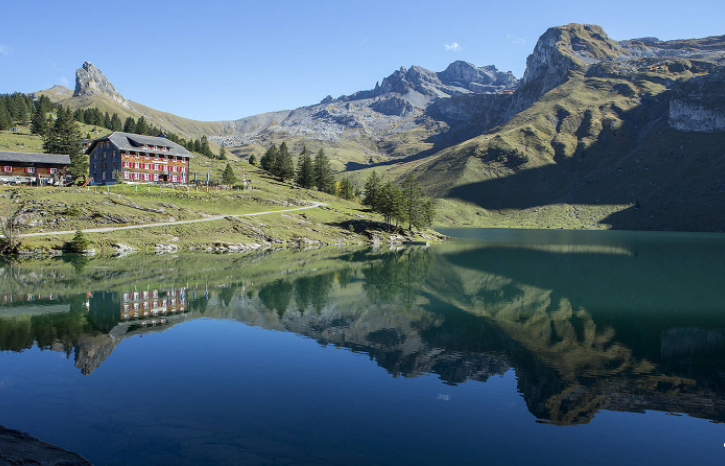 Now hikers are arriving to tackle a three-day/two-night trail that uses cableways and chairlifts to connect remote farms, peaceful huts, and breathtaking views. You arrive in Engelberg on a train from another beautiful spot, Lucerne, only 20 miles to the north. The chalet-style houses in the center of town are surrounded by farmland, forests, and those dramatic peaks cut by ski slopes. It’s picture-perfect. After a quick stop at the Tourist Center to buy a Buiräbähnli-Pass—it includes rides on most of the cable cars along the route—and one more check on the weather, you’re ready to begin the trek. Your first destination is Eggendössli, which you reach by following the trail by Zingel Alp and Lutersee Lake, from which you might see a reflection of the area’s highest mountain, Titlis, on a clear day. Board your first cableway, whose somewhat rickety blue cars were built to transport farm goods over the steep terrain, to descend to the village of Mettlen. Follow the ice-cold Aa River to Büelen, where a cableway (this one feels a bit sturdier) climbs high into the still snow-capped peaks. It’s downhill to Diegisbalm and another cableway to Wolfenschiessen, before you meet up with the river again. That leads to the Brändlen station and, eventually, Berghof Brändlen, the hut where you’ll spend the night. Though the hut, which you booked in advance, is basic, it’s still a welcome sight after a long day of hiking. With your gorgeous surroundings, which will soon include a star-filled sky, you can’t complain. Besides, tomorrow’s portion of the hike—through Haldigrat, Haghütte, and Bannalp—is even more stunning. Plus Alp Oberfeld, the second hut, offers hot food and homemade cheese. Then you’ll celebrate with a beer from Engelberger Klosterbräu, the monastery’s brewery, back in town when you finish. The hiking season will be off to a fantastic start.